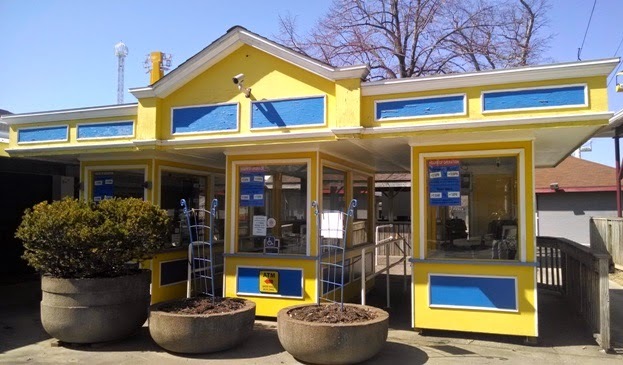 Due to declining ridership and a need for a 2014 expansion space, Mini Enterprise will no longer be operating at Waldameer. However, Mini Enterprise is not headed for the scrapyard. Our friends from another family-owned park, Alabama's Splash Adventure Park, are pleased to offer a home to Mini Enterprise as a part of their children's area expansion. Mini Enterprise may not be that huge, but they needed some heavy equipment. The Helicopters and UFOs have a long flight ahead all the way to Alabama. All packed up. The last view we will ever have of Mini Enterprise at Waldameer. Sniff. Sniff. What might be replacing Mini Enterprise? Our 2014 Park Improvement Map will guide the way. Mini Enterprise's former location won't be empty for long! 2014 will be our last season with our existing Ticket Booths. Just imagine how nice that wide open Midway will feel.